As a stay-at-home-mom, naptime is a sacred time of the day. Don’t get me wrong, I adore my children and cherish the time I get to spend with them. However, I need a break in the middle of the day to recharge… and you know what? So do my children! 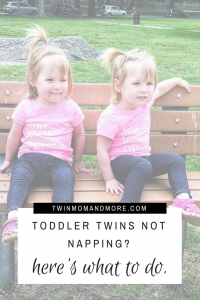 My 2.5-year-old identical twin girls, Josie and Margo have been boycotting their naps recently. 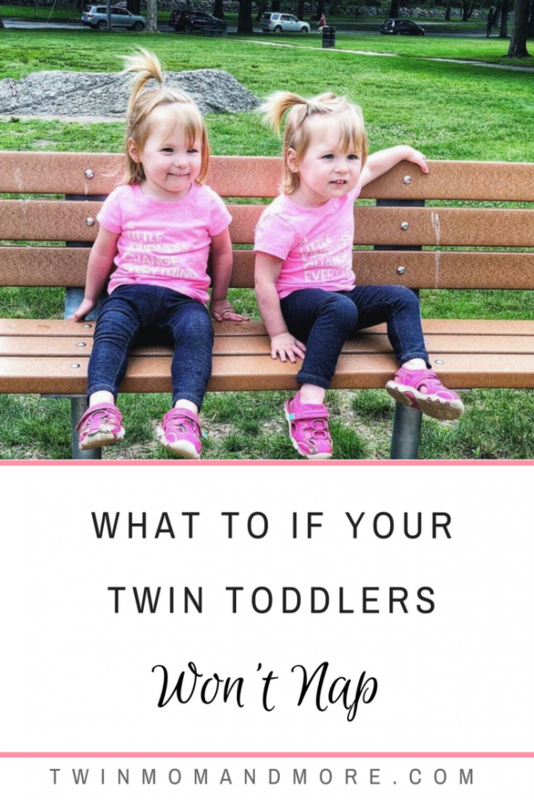 Theo, my 4.5-year-old went through several sleep regressions, and while it definitely wasn’t fun, it made me more prepared to handle my twin toddlers refusing to nap. 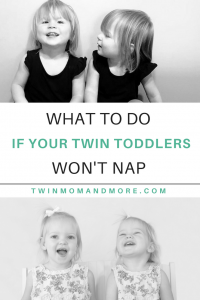 Here are my thoughts on what to do when your twin toddlers won’t nap. Before I get into what to do when your twin toddlers won’t nap, we need to establish why. The answer is simple: because they’re BFF’s and want to chat and play. Do you remember sleepovers as a kid? I sure do. We stayed up allllll night long, talking, giggling, and eating junk food. Your twins are having a massive slumber party during nap time. This is definitely the case with my 2.5-year-old twin girls. There was one day in particular when Margo was tired, rubbed her eyes, and curled up to go to sleep. A few minutes after I left their room, I heard her twin sister, Josie, shouting at her “MARMO! WAKE UP MARMO!” I mean…. it’s adorable, but also so stinking rotten! Sometimes they sing together (complete with shouting “Yay!” and clapping at the end of each song), jump in their cribs, play peekaboo, throw their stuffed animals at each other. You name it and they have tried it. Related: Are your twins climbing out of their cribs?<– This post will help. Are They Ready to Drop the Nap? While children have a whole range of sleep needs, the majority of children still need a nap up until the age of 4. Theo is currently 4.5 and still takes a nap about 6 days a week. When he doesn’t nap, he is still required to lay in bed for rest time. Even when children outgrow the need for a nap a quiet, calm time in the middle of the day is beneficial. This doesn’t mean that there won’t be sleep regressions where you think that they are truly done with naps. Our most recent sleep regression with Theo was only a few months ago and I thought for sure we were going to transition to rest time. After a few weeks, he went back to napping and I am SO glad that I pushed through because it’s apparent he needs the sleep. Unsure if your toddler is ready to drop naps? Read –> When Do Toddlers Stop Napping? Is It A Sleep Regression? A sleep regression is a phase that babies and children go through. If it’s a sleep regression, they will boycott sleep for a while and then go back to their normal sleeping patterns. Sleep regressions are a totally normal part of development, and I have noticed that Josie and Margo for sure have extra long and more frequent regressions now that they are older and truly aware of each other’s presence. The only way to know if it’s a sleep regression or not is to wait it out. Related: More about the 2-year sleep regression. If it’s a sleep regression, there is no need for a schedule change. Don’t make any changes to their schedule for a good 3-4 weeks. It will be the longest time of your life (since your twin pregnancy at least!) but it’s so important to wait. Once 3-4 weeks have passed you can be fairly confident that it’s not a sleep regression and make changes from there. When you make a schedule change be sure to use the same rule of time before deciding if it works or not. Should You Separate Your Twins? I mean, I don’t know! This is where we’re at right now: Margo seems to have higher sleep needs than Josie. She will lie down and try to go to sleep and Josie will start singing and talking and then Margo will join in. We have an extra bedroom and I’ve thought about putting one in a pack n play, but how do I choose who goes in it and who gets to stay in their room? I know they would be upset if we separated them and it might make things worse. For now, we are waiting it out and making no changes. I make sure they have enough mental and physical stimulation during the day so they are tired at naptime. Their room is cool and dark and we always use a sound machine (link to a great, affordable sound machine). Their nap refusal has been going on for about a month, but the last week it has improved a lot. If it doesn’t continue to improve, I will try changing their nap time. As a last resort, I will put them in different rooms for naps. We have continued with the occasional refusal of naps, mainly due to them talking and singing together. Here is what we are doing now: they get one warning. If they get out of their beds, or are too loud, we separate them. They love their room and their beds and really dislike being put into the guest room to sleep. This doesn’t mean that we don’t still have problems, because we do. However, once we seprate them, they always fall asleep. It’s the perfect natural consequence… if you keep your sister awake, you lose the privelage to be in the same room as her! If you don’t have an extra bedroom, you could set up a pack n play in your room or put them in your bed. I should add that they have tried to get out of the room, but we put a childproof handle on the door so they can’t get out. Hopefully, this post helps and we can all have sleeping twins again!